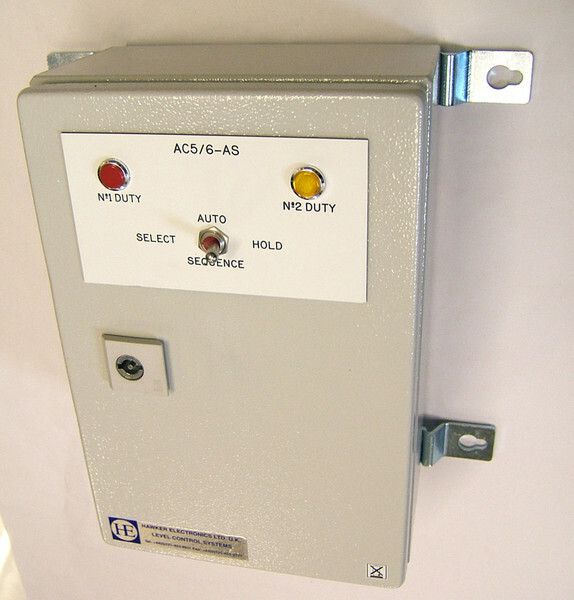 Dual level controller for wall mounting supplied fitted into an IP55 enclosure. Suitable for duty/standby or duty/assist pump control. Available in two options. AC5/6 with manual toggle switch on enclosure doorfor selecting pump operation. or AC5/6/AS with auto sequencing of pump operation ( with hold provision). Fully adjustable sensitivity between 100 ohms to 18,000 ohms.Volt free contacts for pump operation with LED indication and an alarm contact is also available to indicate second pump operation. Normally supplied fail safe low. Supply voltage 110 or 230v AC. Aqueous solutions such as water, sewage, most acids, milk, beer, etc. Double probe operation for control between two levels. Single probe operation for alarms. Very accurate - Relay switches at the exact tip of the probe. Easily set up and very stable. Controls between 2 levels, High Level Alarm, Low Level Alarm, Borehole Level Control. Adjustable sensitivity and close switching differential to ignore electrode fouling and save electric power. Intrinsically safe models available (Data Sheet No 329 ). A.C. current at the probes to prevent possible electrolytic action between them. Full range of hardware available for easy site operation.